When the Agile Manifest was written in 2001, it created a movement back to the core values and principles that are as much common sense as they are practical. Over time, Agile has become accepted and even preferred, especially for projects where there is a high degree of uncertainty. There is no project longer or more uncertain than raising children. Yet the application of common sense to our role as parents often gets as lost in parenting as it does in project management, and we end up with equally dysfunctional behaviors and undesirable results. In 2006 Geof published The Agile Parenting Manifesto to call attention to the core values and principles necessary to raise and develop children in an uncertain world. Mirroring the structure of the Agile Manifesto, it purports five values and 13 principles for parenting. 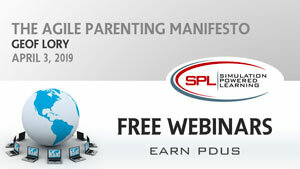 In this presentation we will discuss application of these values and principles to parenting and project management through examples and storytelling from my own experience and those shared with me by family and friends over the course of the past 30 years. Geof Lory is a SPL instructor and Board member. He is a project manager, consultant, trainer and writer. With more than 30 years of practical experience in the Information Technology field, Geof integrates the unique aspects of software development and infrastructure deployment projects into both Agile and traditional project management disciplines. Geof is an engaging speaker and trainer with more than 30 years of practical project management consulting experience. He is the Product Owner for the SPL PM and Agile/Scrum Simulations and is certified to deliver various other team, leadership and project management curricula. He is a Project Management Professional (PMP) and an Agile Certified Professional (ACP) from PMI as well as a Certified Scrum Master (CSM) from the Scrum Alliance.